Garage Museum of Contemporary Art presents The Fabric of Felicity, an international project showcasing clothes in art outside the context of the fashion industry. The exhibition spans five continents and features over forty artists, including representatives of historical avant-gardes, members of the Soviet and Brazilian underground art scenes, and new generation artists from Russia, Japan, USA, Zimbabwe, and other countries. The geography of the show is built around twenty-first-century “silk roads:” the intercontinental transport routes and production cycles of raw materials, textiles, and ready-to-wear garments from democratic global brands. Based on a series of research trips stretching from Sweden to Bangladesh by way of Ivanovo (Russia) and Biella (Italy), The Fabric of Felicity undermines stereotypical notions of East and West, Global South and Global North, and suggests an equality of artistic media, methods, and traditions. The frame of a duchessse brisée, its main body, stands on a red velvet carriage rug embellished with fox skins. A small stuffed bird perches on the edge of the sofa, holding in its beaks and claws a lace-edged linen handkerchief embroidered in red silk: Marie-Antoinette’s apology to her executioner for stepping on his foot. Twelve stuffed foxes wearing red wool felt Phrygian bonnets, lined with pale pink silk – from among their number, two are also dressed in the costume of the sans-culottes (made by artist Clémentine Bedos), the working-class of the French revolution of 1789 – hold a white linen redingote, lined with red silk, and a fine linen robe à reine and its red silk sash (made by dress-maker Marie-Andrée Bernard-Trébern) in their jaws and paws. They bear these costumes of the ancient regime (it should be noted that in the eighteenth century the wearing of men’s clothing was forbidden to women, save for the costume of hunting – la chasse) towards a nineteenth-century mannequin with painted wooden boots, standing on a boar skin rug, around whose headless neck is a contemporary version of an eighteenth-century jabot in dentelle à l’aiguille point d’Alençon, the floral design after the toile de Jouy ‘Bonnes herbes’, the most popular toile of the revolutionary years) and dentelle au fuseau, appearing to be blood-stained, and lined with ivory Duchesse satin (made by former dentellière – there is no masculine name for the profession – in the Atelier National du Point d’Alençon and now artist Thomas Gaugain). Behind the mannequin is the magnificent head of a boar. The night before he was guillotined (28 July 1794) Robespierre tried to kill himself with a pistol but only shattered his lower jaw (there is another version of this: the gendarme Charles-Ndré Merdra claimed to have shot him). In the room of the Committee of Public Safety Robespierre lay on the table until a doctor was summoned to attempt to staunch the bleeding from his jaw. Robespierre’s last recorded words may have been ‘Merci, monsieur’, thanking the man who gave him a handkerchief for the blood on his face and clothing. On 28 July 1794 Robespierre went to the guillotine in Place de la Révolution, without trial. When clearing Robespierre’s neck to meet the blade, the executioner tore off the handkerchief holding his shattered jaw in place, causing Robespierre to produce an agonised scream until he was silenced by the fall of the blade. 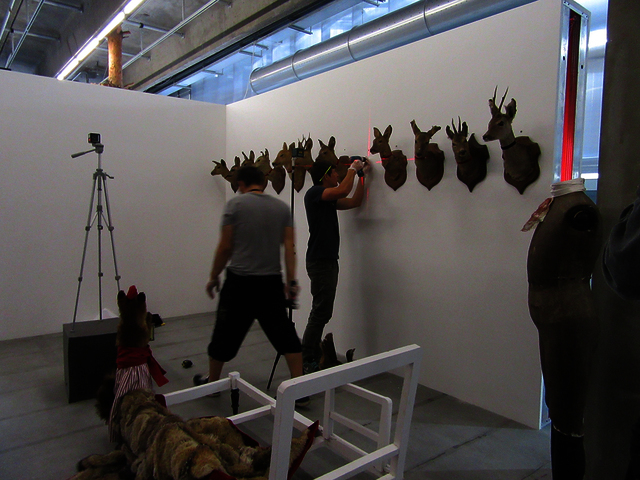 To the left and right of the passage of the glorious, victorious vulpine mob are twelve stuffed deer heads. Around each neck is a red ribbon, like that sported in defiance by those attending the bals de victimes (which may be apocryphal). They came to prominence after the death of Robespierre, first mentioned in popular writing in 1797. They are supposed to have been attended by those who lost a member of their family under the Terror, and, their property now restored to them, they established aristocratic, even decadent balls. Some attendees wore mourning clothes; others wore elaborate costumes. Women dressed in the style of the merveilleuses, in Greco-roman attire, sandalled or barefoot (for one went barefoot to the guillotine). Women and men alike often wore a red ribbon around the neck, at the point the blade of the guillotine would have made its fatal cut. Opposite the twelve deer (twelve – for each member of the Committee of Public Safety) are twelve watercolour drawings of guillotined heads, as though sketched in situ from life, or rather, from death.